Although it might not feel like it, Glacier National Park is all high-altitude, alpine territory, and with that territory comes with the ever-changing weather that the alpine is known for. You might be used to alpine terrain, but your family sure isn't, and you'll need a family-friendly tent that can handle high-altitude terrain even though you're car camping. 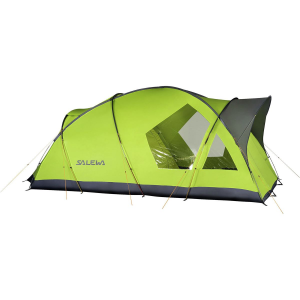 Salewa's Alpine Lodge IV Tent fits that ticket. Unlike most high-altitude tents, this 3-season shelter boasts that large internal space that parents need to take care of their children. Its freestanding, geodesic design stays taught against harsh winds and rainfall. Speaking of rainfall, the vestibule is large enough for the four of you to change out of your soaking rainshells and into cozy pajamas before you even enter the sleeping space. The vestibule also features two large windows and two interchangeable doors that you can open as wide as the tent or keep completely closed in a downpour.